Even if you do all your shopping with reusable bags, you’re going to end up with a bunch of plastic. Your bread comes in it, your toilet paper, your organic carrots and non-GMO freekeh from the bulk bin and no, it can’t be recycled with your bottles and cans. The same goes for all the plastic that swaddles your online purchases. 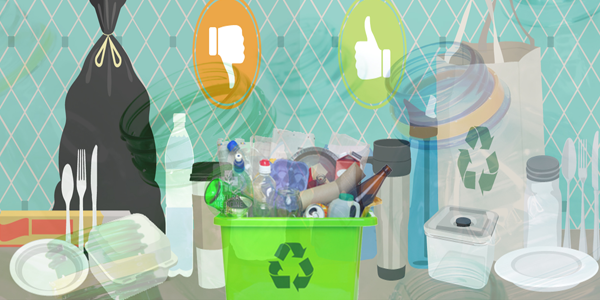 But you can still recycle all that excess plastic–it just takes a tiny bit more effort. If your local grocery, drugstore, or big-box store has bins for recycling plastic bags, you’re in luck. Because those bins accept way more than just plastic shopping bags, including all kinds of stuff you’re probably currently throwing out, like dry cleaning bags, zipper storage bags, the plastic wrapping that goes around everything from diapers to six packs of soda; some kinds of clear quilted air-filled packaging that comes in shipping boxes, and padded plastic mailing envelopes from Amazon and their ilk. Grab one of the many plastic bags in your possession and stuff it somewhere convenient: maybe under your kitchen sink, by your regular recycling bin or trash can, or–ideally–inside one of your reusable grocery bags. Fill it with all the recyclable plastic bags and films you’d otherwise throw out. When you grab your reusable bag to go to the store, grab your sack of discarded plastics, too, and take it straight to the bin. Done. A few less plastic things for turtles and fish to choke on, a little less fill for the landfill. More packaging manufacturers are using a newish labeling system that makes it easy to figure out what the heck you can and cannot recycle in these in-store bins (just look for the “Store Drop-off” label), and where to do it. Participating stores include Target, Lidl, Wegmans, Lowe’s, Safeway, and Wal-Mart.